Peenemünde, once a small village with a fishing harbour at the north end of the island of Usedom has become a synonym for Nazi-technology, the concept of 'total war' and the exploitation of human 'resources'. Here between ten and twenty thousand forced workers run the complex needed for the production of the infamous V1 and V2 'Vergeltungswaffen', a word creation by Joseph Göbbels. From 1936 till 1944 Hitler gave his prime rocket engineer, Wernher von Braun, every support needed to proceed with the construction of rockets that would, in Hitler's view, force the allied into submission. Let's not forget that in 1944 in a laboratory close to lake Constance at the Swiss border scientists attempted to split uranium atoms. The fictional outcome is brilliantly worked out in Thomas Harris' novel 'Fatherland'. Although the Nazis managed to keep their activities in Peenemünde under wraps, the complex was a massive affair: a rather large harbour, a massive power station particularly needed for the synthesis of oxygen as rocket fuel (8000 Tonnes a day), barracks for soldiers, workers and prisoners, trains for transport and much more. All in all about 20.000 V1 (which looked like a cruise missile) were launched against targets in London, Norwich and Antwerp. Another 5300 V2 rockets were launched, 9000 alone against London. 2350 of those found their 'target'. Sort of. Still, with a payload of about 950 Kilos, the damage inflicted was massive. Finally Great Britain found out where those weapons came from and in 1943 attacked Peenemünde in an air raid involving several hundrets of bombers, but didn't manage to destroy the infrastructure. In 1944 the US Air Force attempted another raid, this time with more success: subsequently production and development was relocated to a subterranian centre in the Harz region, close to the KZ Dora. There alone about 20.000 workers were forced to work towards their death. After the war, Wernher von Braun, despite his role as SS-officer, together with hundrets of his engeneers and scientists started to work for the USA, both involving peace missions (Explorer 1, Pioneer 4, Apollo) but also developments sustaining the paranoia that was called the cold war. As the leader of possibly the most modern technology centre at the time, Wernher von Braun advanced to Hitler's last hope, producing 'Wunderwaffen', which randomly targeted the enemy. His knowledge made him too important for the US to miss out, and in 1977 he died as an honoured man. History can be full of cynizism. This is ridiculous, amazing, eery and unique; words can't describe the impression you get while walking along the beach along a line of buildings about 2.5 Kilometres long with empty windows and no soul. 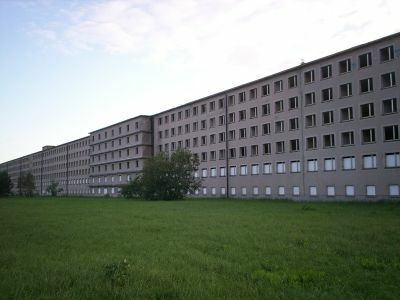 Prora, KdF Seebad Rügen, so its original title, is one of the more ambitious programs realised by the NS organisation DAF for its subsidiary Kraft durch Freude (Strength through Joy), a hotel complex to hold 20.000 holidaymakers with a turnover of 1.5 million a year, but never ever finished. "Auf Befehl des Führers sollte erreicht werden, daß dem Volke zur Erholung seiner Nerven im Tempo der Zeit genügend und ausreichende Erholung gegeben würde." Part of it the department for holidays, leisure time and Walking and the department for Beauty and Respectability of work. And of course the outlook, to use the buildings as a mega-hospital for soldiers and civilians who happen to be at the front-line. In close proximity they built a train station, a power station, waterworks, a camp for the Hitler-Youth, a slaughterhouse, a village for the workers, and many new roads. Anticipated to follow an enforced beach for about three miles, five houses each 500 metres long remain, the other 2.5 Kilometres either not built for reasons of war or demolished by Russian forces after 1945. Houses that look the same for 2.5 Kilometres don't just look weird, but inevitably represent a time where every worker would be not more or less than a sprocket in a humming engine, an engine powering kind of an ant-state where everybody becomes a more or less appropriate pawn in a game of chess. Three miles long, six stories high, uniformed and hudge. Nowadays, in partcular in the north, the hollow shells of demolished ruins tower over the dunes, leaving me with some fascinated bafflement; somewhere between beautiful and ultimately horrible. Walking along the beach at nightfall, I meet a young family who lit a fire, and they are the only ones I meet. Preferable to 20.000 brainwashed idiots bathing underneath a row of swastikas, don't you think?